Most Popular Backwater Destinations in Kerala! 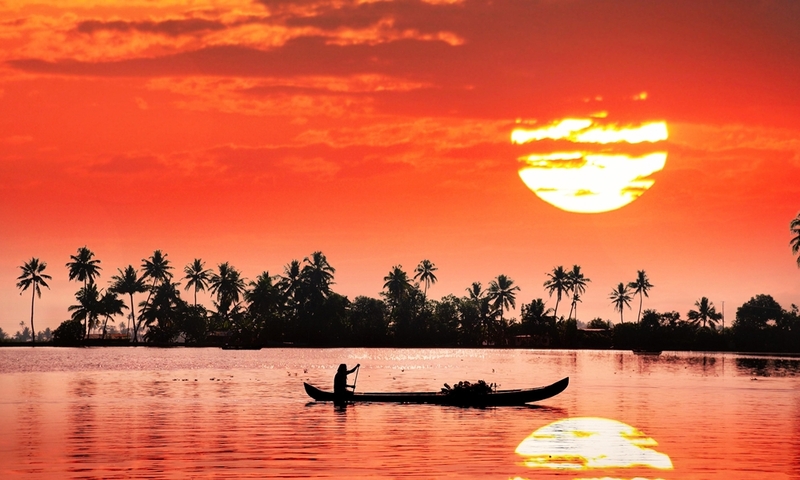 Kerala’s backwaters are both serene and scenic. They offer a perfect opportunity to break free from your daily rut. The placid waters are beautifully complemented by the coconut palms on the shoreline. Also, the village scenes on the shores are a treat to watch. Apart from the scenic beauty all around, there is something else that makes the backwaters of Kerala extremely special. It is the different activities they have to offer. Kerala’s backwaters feature activities like houseboat cruises, canoe rides and boating just to mention a few. All these activities allow you to soak in the natural beauty around and also, to have a fun experience. Take a look at the most popular backwater destinations and see what makes them special. Set against the breathtaking backdrop of Vembanad Lake, the largest one in Kerala, Kumarakom is extraordinarily beautiful. The dramatic way nature unfolds here is sure to make you awestruck. Things are pretty much kept simple in this village which is basically a cluster of islands. And witnessing the simple way of life, among the locals, from the luxury of your cosy houseboat, will prove to be a timeless experience. Kumarakom offers you the best backwater experience as lots of resorts and luxury houseboats are available here all of which have A to Z facilities. But the highlight of Kumarakom’s backwaters is its bird sanctuary. You can see some exotic birds like the Siberian Stork, Egrets, Darters, Cuckoo, and many other migratory ones. When at Kumarakom Backwaters, do not forget to indulge in some Kerala delicacies. As you cruise along the backwaters, ask your guide to arrange for a fresh ‘Madhura Kallu’. It is sweet toddy extracted from the coconut palm. Binge it with spicy Kerala style Karimeen (Pearl Spot Fish) and Kappa (Tapioca). By the end of your Kumarakom trip, it’ll be a fascination that will be hard to let go. When you plan for Alleppey, come prepared to leave a part of yourself behind, because the whole experience here is so indulging and exhilarating that you won’t feel like going back at all. Just imagine sleeping under a blanket of stars on a night which is unusually quiet and solemn, and then waking up to the sound of whistling ducks that cross your way. And in-between, you embark on an invigorating journey through a vast network of canals. You traverse across vast stretches of paddy fields and coconut trees which are gently swaying in the air. Scenes like the beautiful Kingfisher bird diving in the water to grab a fish and the school children happily making their way to school in boats give you a hint of the blissful life that exists here. All in all, the views are simply spectacular and the experience is truly magical, which is when you realize why Alleppey is called ‘Venice of the East’ and Kerala is called ‘God’s Own Country’. Alleppey, also known as Alappuzha, gives you the option of exploring the mysterious backwaters on a country boat that can fit in narrow canals or large houseboats that have all the amenities like a furnished bedroom, modern toilets, cosy living rooms, a kitchen, and even a balcony. With the Arabian Sea on its West, there are some extraordinary sights on display as your boat across this vast network of lakes, lagoons and fresh water rivers crisscrossing it. You can also drop by the villages near the banks to see the coir making industry or try some freshly made tapioca and fish curry. A name worth mentioning is ‘Kuttanad- the rice bowl’. It is the only place in the world where rice cultivation is done below the sea level. Equally famous for both families and honeymoon couples, Alleppey is, one must-visit destination in India which will bowl you over. Kollam, also known as Quilon, has historically been an important port city of India for spice trading. Its prominence has been appreciated from time to time by some of the legendary explorers like Marco Polo and Battutatuta. But as on date, the city is of even greater symbolic resemblance to the locals and tourists, for its captivating backwater experiences. The great Ashtamudi Lake, often called as the ‘Gateway city of Kerala Backwaters’, covers one-third area of Kollam. The lake offers you some of the best panoramic views in the Kerala state. Ashta means eight and Mudi means branches. So Ashtamudi, a term coined for eight branches, is actually a conflux of these eight channels converging into a single outlet to enter the Arabian Sea. The Ashtamudi wetlands are listed under wetlands of international importance. There are many houseboat cruise packages available in Kollam. In Kollam, it indeed feels like a romantic date with nature. Your houseboat cruises along zig-zag water channels and criss-cross canals and you hear the chirping of migratory birds which are as excited as you. Don’t forget to spot the iconic Chinese fishing nets which, when laid on the water gives an oriental look to the whole landscape. Nileshwar is one of the best places to enjoy the captivating Malabar shoreline. Just imagine yourself coasting along beautiful coconut and palm trees, cherishing the tranquillity of nature. Nileshwar is a refreshing change from the commercialized backwater hotspots like Alleppey and Kumarakom. So you get uncompromised and undisturbed time to spend with your loved ones. Also known as Nileshwaram, this cultural capital of Kasaragod boasts the most authentic houseboat experience. Because it has fewer crowds, visitors get a raw naturistic setting to enjoy. It has become more and more popular among couples, honeymooners and offbeat travellers, as it is more or less, unexplored and quaint. You can also ask your houseboat provider for canoe rides and fishing activities. Kozhikode, also known as Calicut, has a long tryst with fascination. Legendary explorer Vasco Da Gama, landed here when he discovered the first ever sea route between Europe and India. The city has been a major commerce and trading centre since then. But today’s Kozhikode still retains the magical charm and paradisiacal element for nature lovers. The Kozhikode backwaters promise you a pristine as well as an unruffled backwater experience. This could be your moment in the lap of nature against the backdrop of scenic rivulets, enticing lakes, and zigzag canals. Kozhikode backwaters give you a rare opportunity of exploring the countryside of Kerala and enjoying the majestic surroundings without much hustle and bustle. Fewer crowds here mean more exclusive experience. As you sail along the Canoli river and the Kallai river, you will be accompanied by some winged friends. Bird watching is very popular here as this region plays host to many domestic and migratory birds. Some of them are Sandpipers, Whimbrels, Gulls, Terns, Grey Herons and many more. Combine all this with the cultural and heritage beauty of this city, and Kozhikode becomes a must-visit destination on your list. Now you know what makes Kerala backwaters so special. Whether you come with your entire family, with your spouse or just by yourself, the backwater experience is an unforgettable one. Why not plan a trip to Kerala backwaters right away!